When the body is forming, particular signals are given off by cells within the upper limb. These signals control the growth and development of the hand and fingers and the entire upper limb. The process of formation of the hand and fingers happens within the first 10 weeks of pregnancy, starting as early as 20 days of gestation. 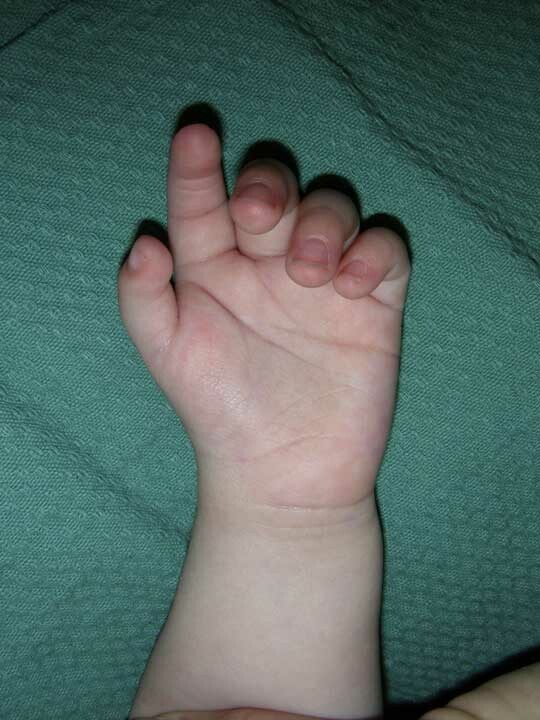 If these signals go wrong then the hand and arm can form in different patterns leading to a congenital hand difference. The known signals that control growth of the hand and fingers control how many fingers are formed and where they are formed. The signals can be too weak leading to smaller underformed or missing digits (Hypoplasia ) or too strong leading to extra digits (Polydactyly). Depending which side of the hand the signal originates from this may mean extra thumbs or little fingers or absence of the thumb or little fingers or even joining of digits (Syndactyly). 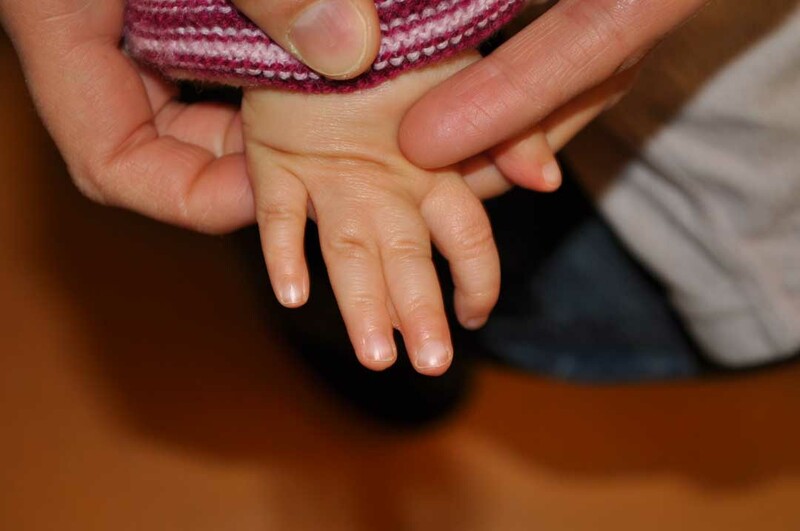 Other than the signaling factors there are other events that can occur during gestation that have an affect on the growth and development of a childs hand and upper limb. This can be genetic factors (differences of the hand are occasionally part of a larger genetic disorder), physical or chemical factors. There is a very wide range of differences of the hand that will affect the use of the hand in different ways. In many conditions surgery is not necessary and the functional ability of the hand will be excellent. In some minor differences all that is needed is input from hand therapists to maximize the use of the affected hand. In others the condition can be repaired and or the function of the hand significantly improved with surgery. The arrival of a new child is a very exciting time. There are many jobs to do and things to plan. 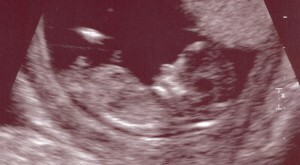 At the prenatal ultrasound scans occasionally defects are identified in the hands or feet. The ultrasounds are good at identifying that a difference is present but are not particularly good at identifying the exact components of any difference. Many parents to be are alarmed by the finding of a difference with the limbs and an appointment with the treating surgeon in the prenatal period can go a long way to relieving fears and concerns. Because of the indefinate nature of the ultrasound findings these appointments are of a general nature and cover the possibilities of management in the future. Once baby arrives an appointment will be made with your surgeon for a review where the hand or foot can be examined directly and a management plan prepared specifically for your child. 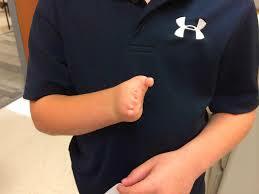 The vast majority of children with hand differences function exceptionally well and may not require surgery. If surgery is required it is usually performed once the child has developed slightly and the anaesthetic risks are at their lowest. This varies for each child and each specific hand condition but is usually around 1 year of age. For those that do require surgery excellent functional outcomes are usually possible and the hand differences generally do not restrict opportunities and functioning in life. 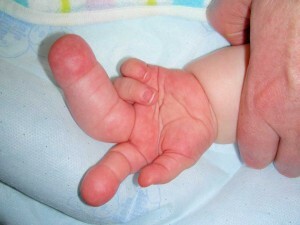 When the signals that tell the body to form a finger or thumb are too strong extra digits can form. This is known as polydactyly (many digits). If the extra digit is on the thumb side this is known by many names such as duplicate thumb, radial polydactyly, bifid thumb and several others. On the little finger side of the hand it is commonly known as ulnar polydactyly. Duplications in the central digits are less common but still well documented. 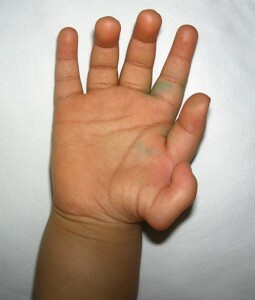 Duplicate digits are relatively common occurring in up to 1% of children in some populations. The size of the duplicate varies greatly from small skin tags right through to fully formed and mobile digits. Duplicate thumbs occur approximately 1 in 10 000 births. 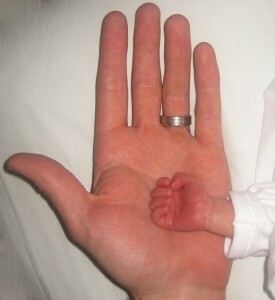 The size of the extra thumb varies quite widely and the degree of attachment to the other thumb also varies quite widely. A more accurate description of this condition is a split thumb as each of the duplicate thumbs is usually smaller than an unaffected thumb. Surgical correction of a duplicate thumb must address the size and position of the thumb including the bones, tendons, muscles, ligaments, nails and soft tissues. Depending on the degree of duplication and size of the thumbs the exact required surgery will differ. 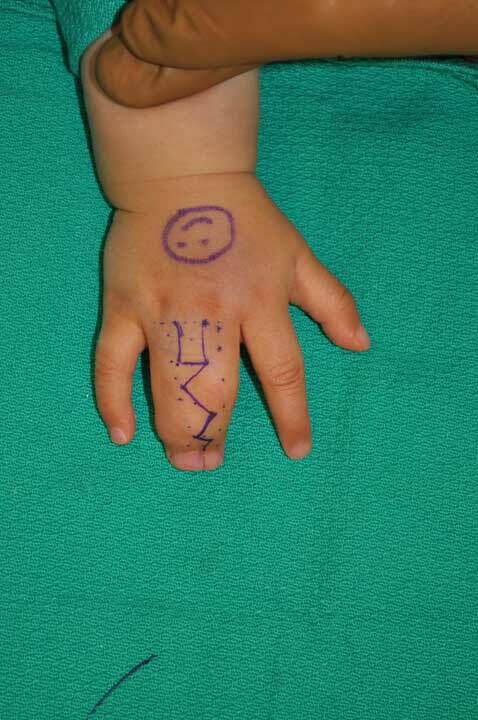 Your surgeon will carefully examine your child’s thumbs, hand and entire upper limb. The procedure that is most suitable and will produce the best functional thumb for your child will be discussed at your appointment. The majority of little finger duplicates are quite small and are often attached by a thin bridge of skin to the rest of the hand. These fingers are often “tied off” in the nursery in hospital. Sometimes this is all that is required for correction. If the extra digit is more substantial and has larger connections to the rest of the hand the correction may have to be performed surgically. The surgery will take into account the function of the other “normal” little finger and the components present in the “extra” little finger. Depending on these factors the surgery my need to combine elements from both of the digits to achieve the maximal function of the remaining finger. At your appointment your child’s hand and upper limb will be thoroughly examined by your surgeon. X rays are not always required. The need for and timing of any x-rays will be determined by your surgeon at your appointment. The timing of surgery for duplicate digits is a careful balance between achieving the best form and function early enough to allow normal hand usage and pattern development and minimizing any risks of surgery and anaesthesia. Depending on the size and degree of complexity of the required surgery this is usually around 12 months of age or later. The term “Hypoplastic” means undergrowth and refers to a small underdeveloped or even absent thumb. 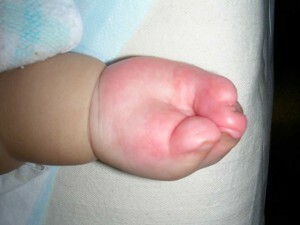 It is caused during development by a deficiency in the signals from the radial side (thumb side) of the growing limb. Depending on the strength of these signals the size and function of the thumb can vary greatly. In the mildest form the thumb is present in the normal position with all the normal tendons, joints and muscles present though slightly smaller than a normal unaffected thumb. In more severe cases there can be absence of some of the tendons and muscles leading to weakness and inability to use the thumb normally. If the joints at the base of the thumb are underdeveloped the thumb can be loose and unstable. In the most severe forms the thumb can be attached only by a thin stalk of skin with no bony attachments or even absent altogether. When the thumb is insufficiently developed children will try and adapt to use the fingers to pinch in a side to side fashion (this is known as scissor pinch). There are a range of surgical options available to correct a hypoplastic thumb depending on how severely affected it is. In the milder forms surgery involves stabilizing the existing joints with ligament reconstructions, and restoring muscle functions by repositioning the attachments of muscles and tendons to maximize function. 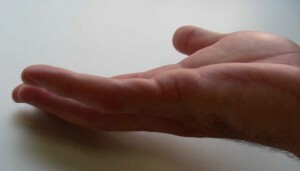 Where the joints are not present or sufficiently developed better function may be achieved by using the index finger to replace the thumb function. This is done with a procedure known as “pollicization” where the index finger is rotated into the position of the thumb to allow it to pinch tip to tip against the other fingers. Where reconstruction is indicated this is best done between the ages of 12 months and 3 years while children are still developing usage patterns of their hands. After this age surgery is still possible but often requires more input from hand therapists to maximize the functional ability of the reconstructed thumb. At you appointment your child’s hand will be thoroughly examined. If you have x-rays please bring them to your appointment. 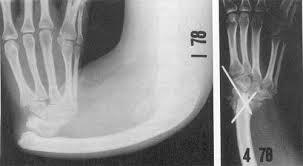 If not the timing of such x-rays will be discussed with you in relation to the timing of surgery. After assessment of the thumb and hand function the suitable options will be discussed with you and a plan made to maximize the hand function for your child. 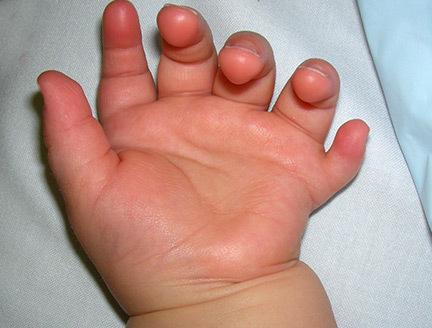 When a child has joined fingers or toes this is is known as syndactyly. This is a common difference in hands and feet. The degree of join between digits varies from patient to patient. The join may be just skin or may involve the nerves, blood vessels, nails or even bones of the fingers and toes. On the hands syndactyly is usually surgically released to allow normal use of the hand and a hand with five separate fingers. 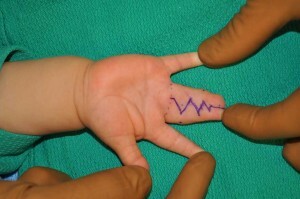 The degree of join between the fingers will determine the exact surgery that is required. Often due to a lack of skin on the fingers skin grafts are required where skin is taken from elsewhere on the body and transferred to the fingers. 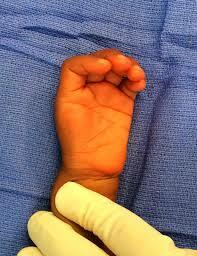 If the join of the fingers is less severe it may be possible to separate the fingers without using skin grafts. 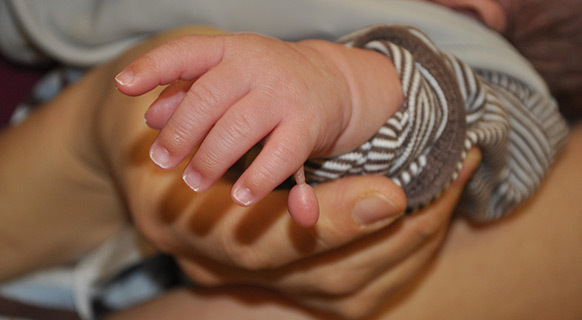 The timing of surgery for correcting syndactyly is a careful balance between achieving normal anatomy as early as possible to normalize growth and use of the hand, and minimizing any risk from surgery and anaesthetic. This surgery is usually performed around 12 months of age but this will vary depending on which fingers are joined and the degree of the join. 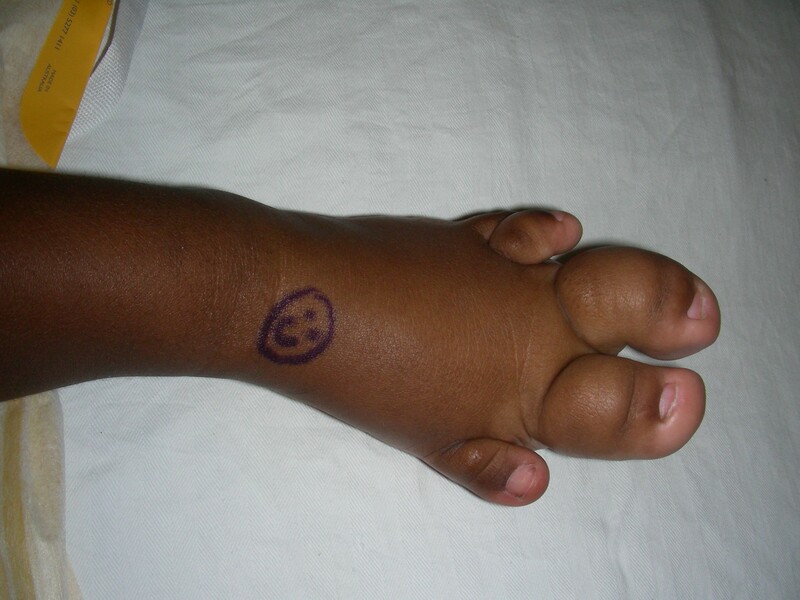 Surgery for syndactyly is usually done as day surgery. Dressings will be required on the hand for up to one month afterwards. Radial Ray Dysplasia refers to absence of structures on the thumb side of the hand and forearm. This ranges in severity from a slightly smaller thumb to complete absence of the thumb and radius (bone in the forearm). The absence of the radius leads to angulation at the wrist which as previously been referred to as “radial club hand”. In many cases it is possible to stabilise the hand on the end of the wrist in a straighter position to improve function and also to improve the function of a smaller thumb or even replace an absent thumb. Your surgeon will discuss the potential options with you at your appointment. Symbrachydactyly refers to undergrowth of the middle part of the hand. 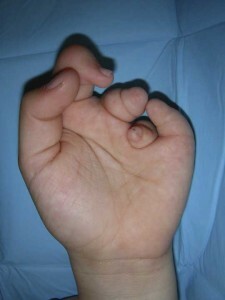 The degree of involvement ranges from mildly shorter central finger through to complete absence of the fingers and wrist. Depending on the degree of involvement there are surgical options to maximise the function of existing fingers and digits, to lengthen fingers or even to add extra digits if necessary. It is not usually possible to make a “normal” appearing hand but there are very good options to improve function in many cases. The suitable procedures will be discussed with you at your appointment. Clinodactyly refers to a finger that has grown with a sideways bend on it. 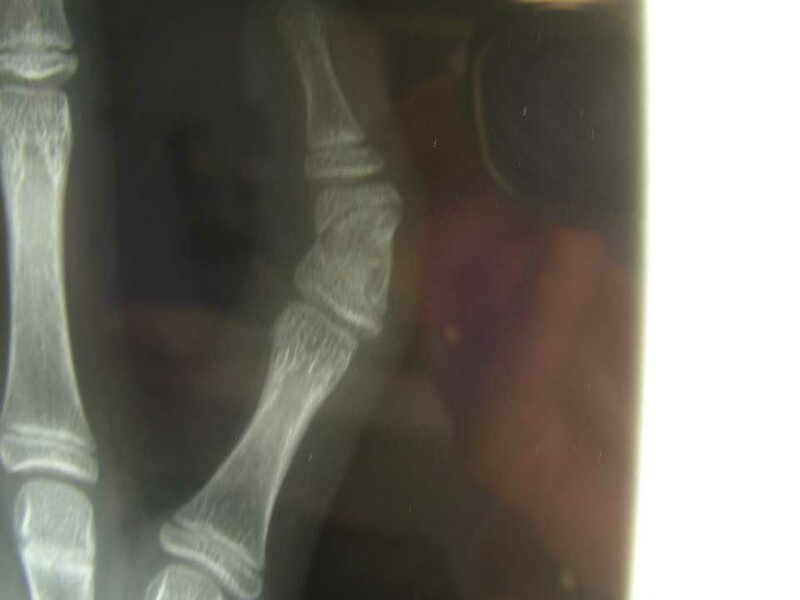 This is usually due to the bones of the fingers growing more on one side than on the other. 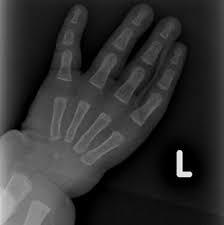 In young children X rays of the fingers may demonstrate a “growth plate” that wraps around one side of the affected bone, or in adults simply a curved bone. In older children nearing the completion of growth it may be necessary to correct the position of the bones by resetting the bone to straighten the finger. This is known as a corrective osteotomy. This procedure is best done near the end of skeletal growth near the end of the teenage years. If the procedure is done too early the deformity may recur as the bones continue to re-grow necessitating further surgery later in life. Camptodactyly refers to the inability to straighten the fingers. It is due to tightness of the structures on the front of the fingers. The structure most commonly causing the tightness is the tendons that move the finger but can be any of the structures including nerve, blood vessels, ligaments and even the skin. In most cases of camptodactyly splint age by an experienced hand therapist is able to progressively stretch out the affected structures to achieve a straight finger. 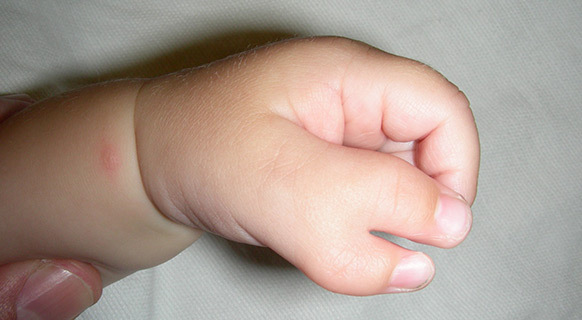 As a child grows the bones may grow faster than the tighter structures leading to an increase in the bend of the finger. With the use of appropriate splints this is usually able to be treated without surgery during periods of growth. Very occasionally splints will not be sufficient to correct the bend on the finger and in this case surged to lengthen the affected structures can be very effective. Overgrowth of the digits and limbs can occur from many causes. The components involved vary depending on the cause of the overgrowth. There are several surgical interventions available that can limit the growth of a limb or digit or decrease the size of an already enlarged digit/limb. Your surgeon will discuss with you the appropriate interventions and the timing of these.